With the cold weather here and snow on the ground, fishing season for me is basically on hold until we get a decent winter day (30's-40's F). I'm not a fan of ice fishing, it's too much hassle and too nerve wrecking for mostly panfish LOL (just my opinion, I know some of you enjoy ice fshing). 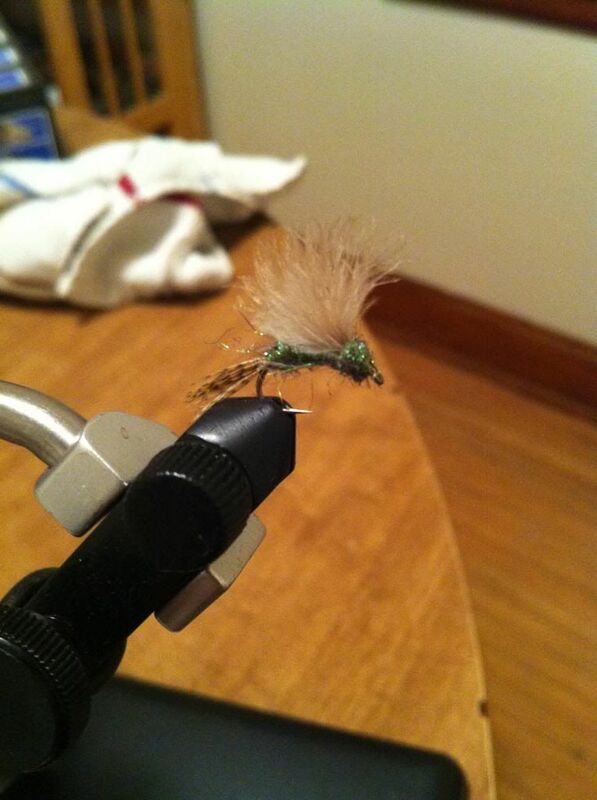 To help pass the time and also teach myself some new tricks, I also have been learning to tie my own flies for fly fishing. 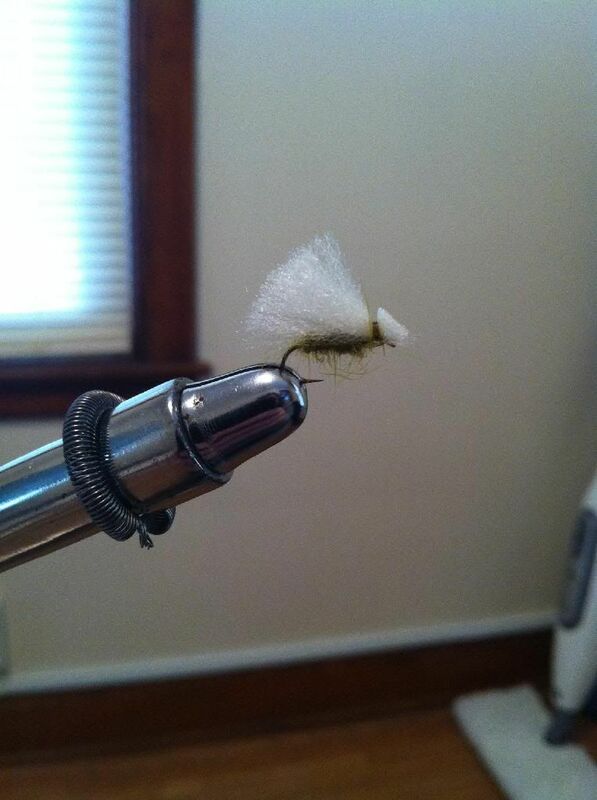 It's coming along, gettin good at it with some mistakes still, but it really gets so much easier after you tie your first one. 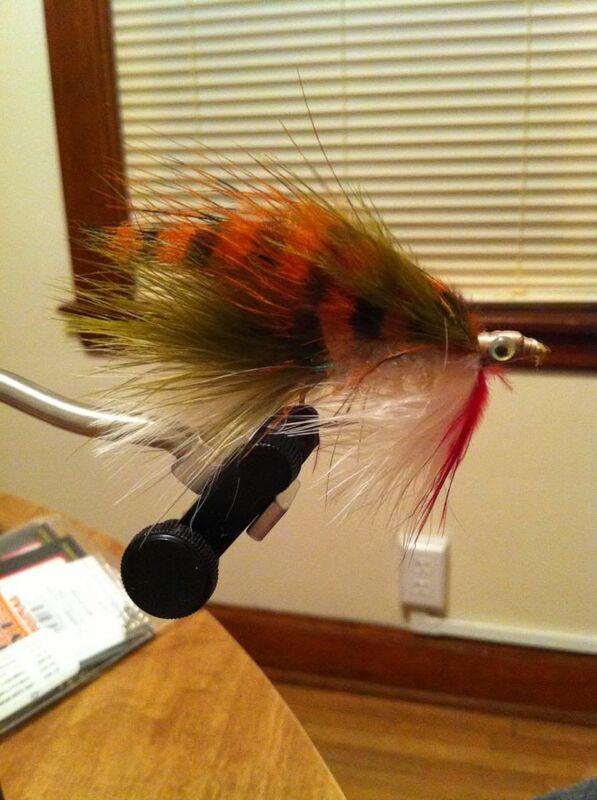 I've been experimenting by making tiny and large flies, covering the gamut from small trout and panfish to Northern Pike and Muskie. 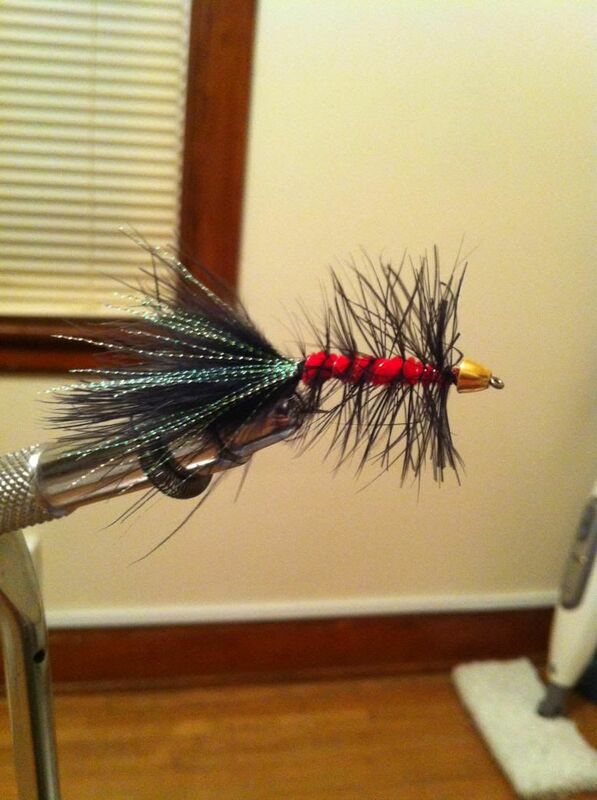 Most of these flies are pretty basic, and then its a point of just getting creative with them. 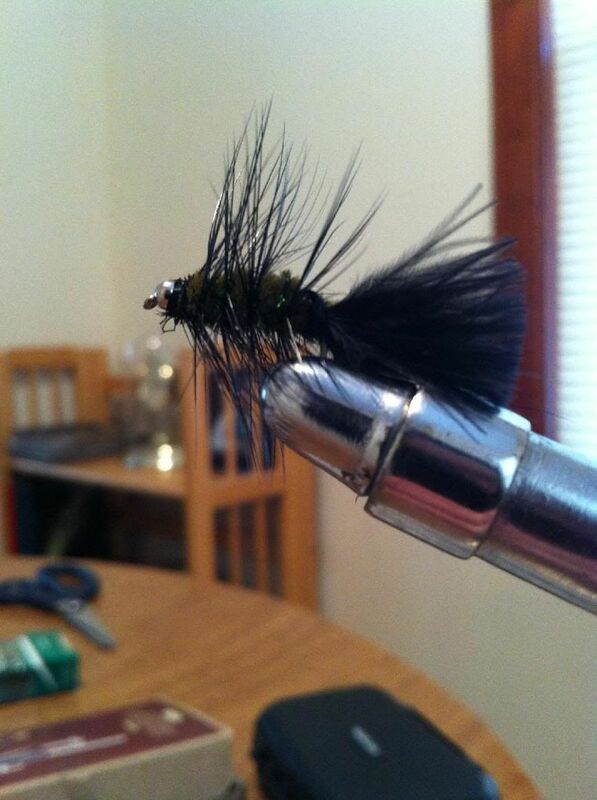 Just thought you guys might like to see some of my work if you are interested, as fly tying is an art in itself for sure, and quite satisfying! 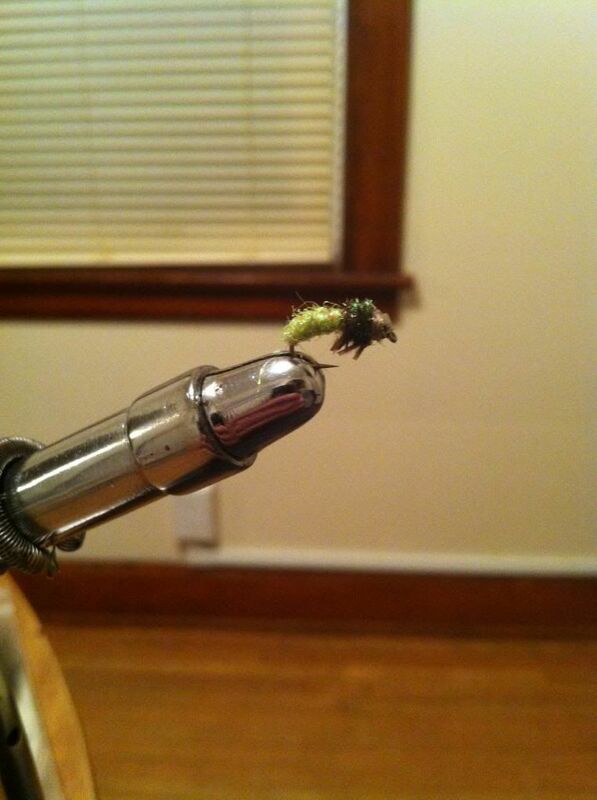 A tiny little Poly Caddis Fly. 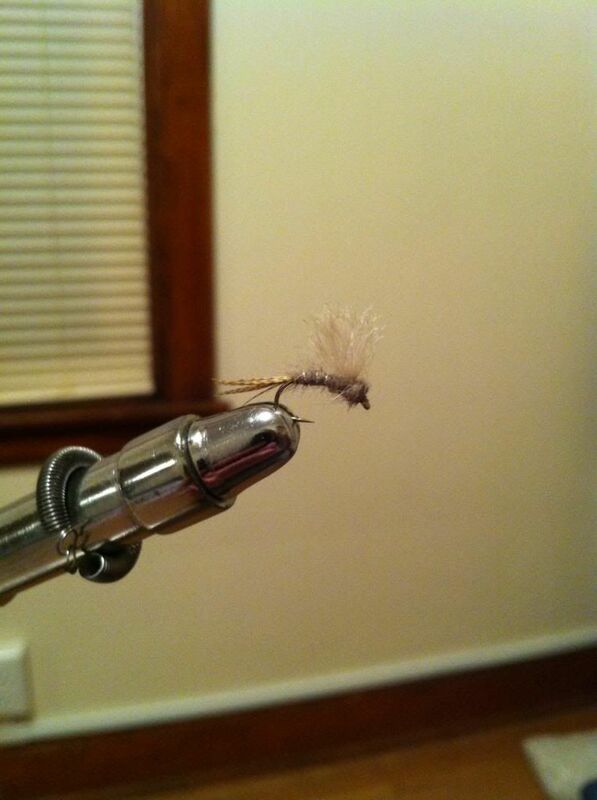 Its a dry fly, so it stays on the surface. 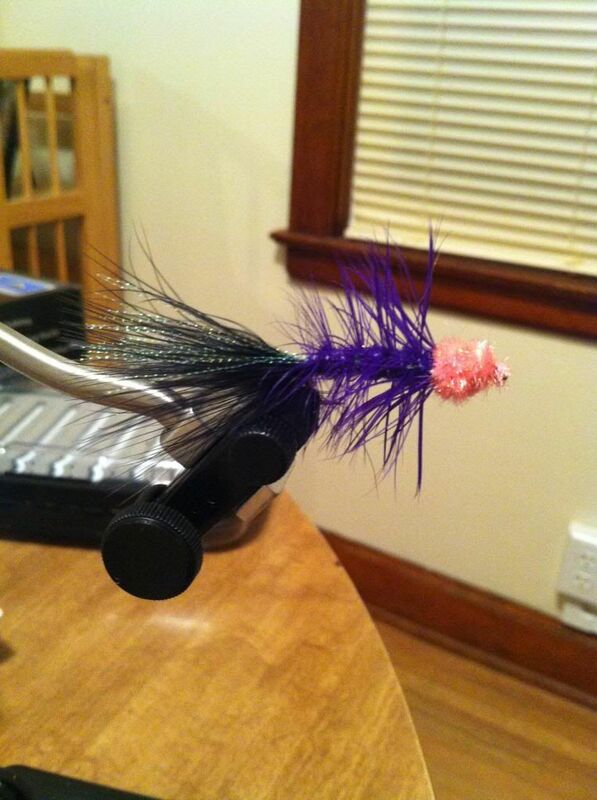 Hoping to catch some Brook Trout on it this spring! ...And here is that idea. 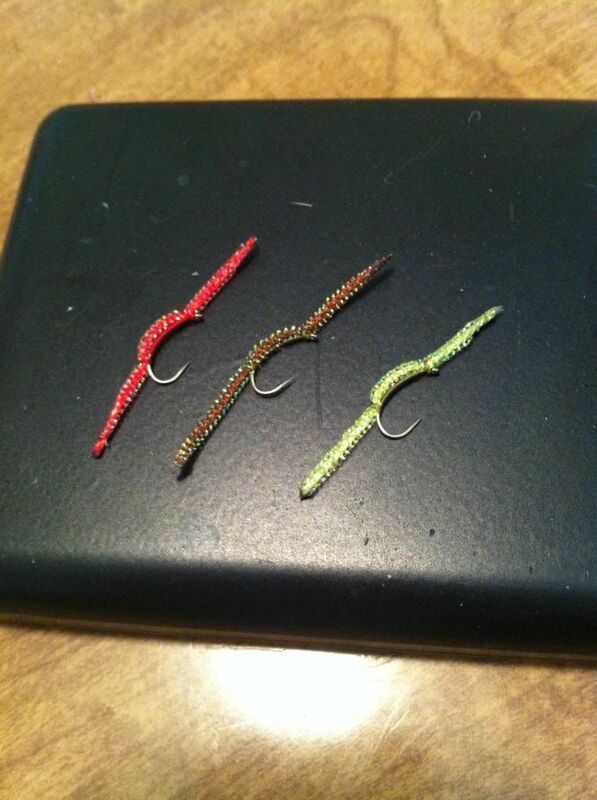 A Cone Head Leech Pattern. 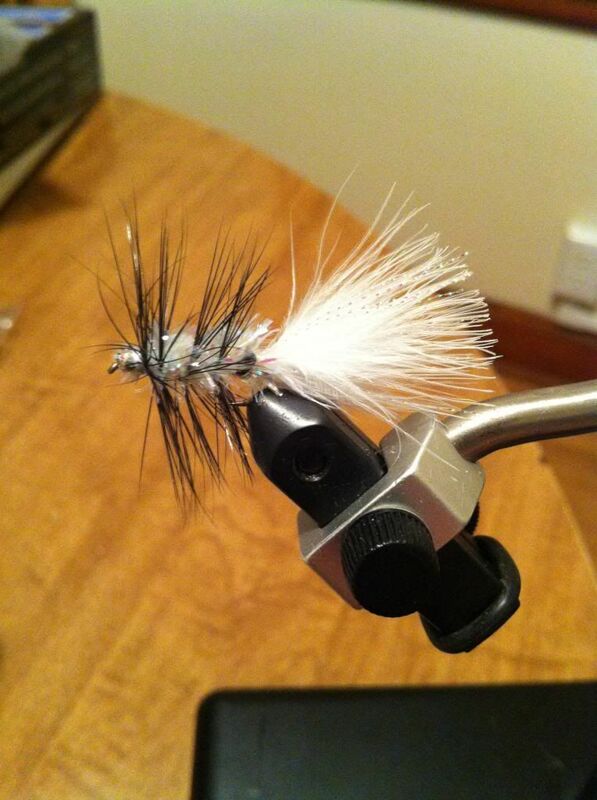 Tied it like I would a Woolly Bugger. 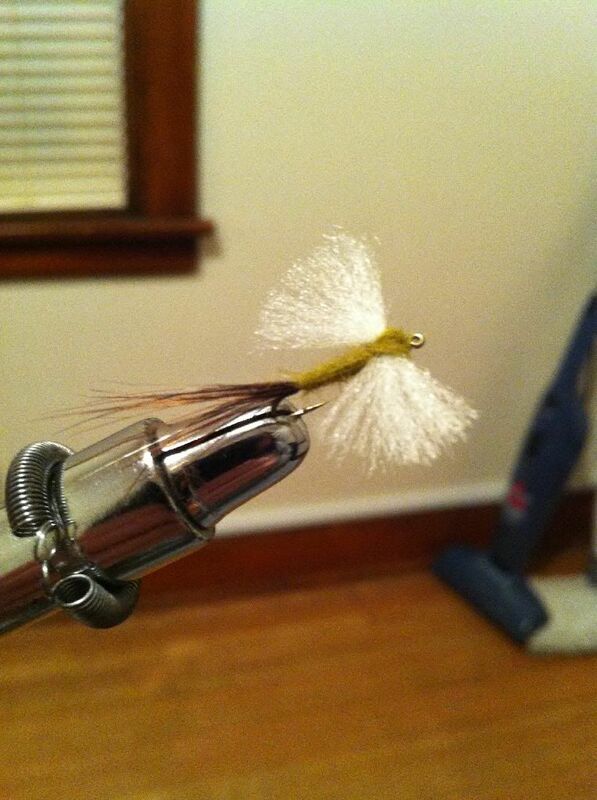 I also used too thick of a saddle hackle feather, but I think it turned great, and another one that looked fantastic in the water! 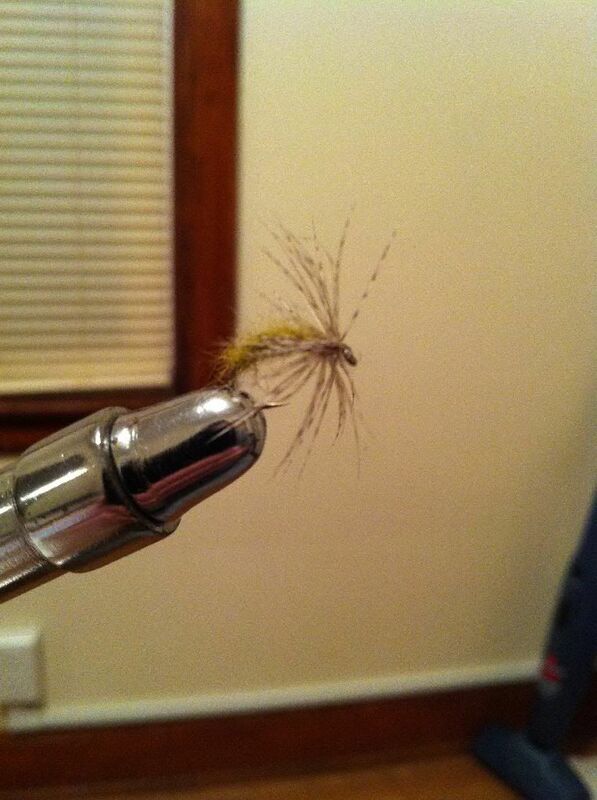 Finally, 3 versions of a Soft Hackle fly. The first one is your basic, the second is the Bead Head version, and the third is a Bead Head version with some gold tinsel I used for ribbing. Turned out well, I think! So, that's about it for now. I am still practicing and getting better day by day. 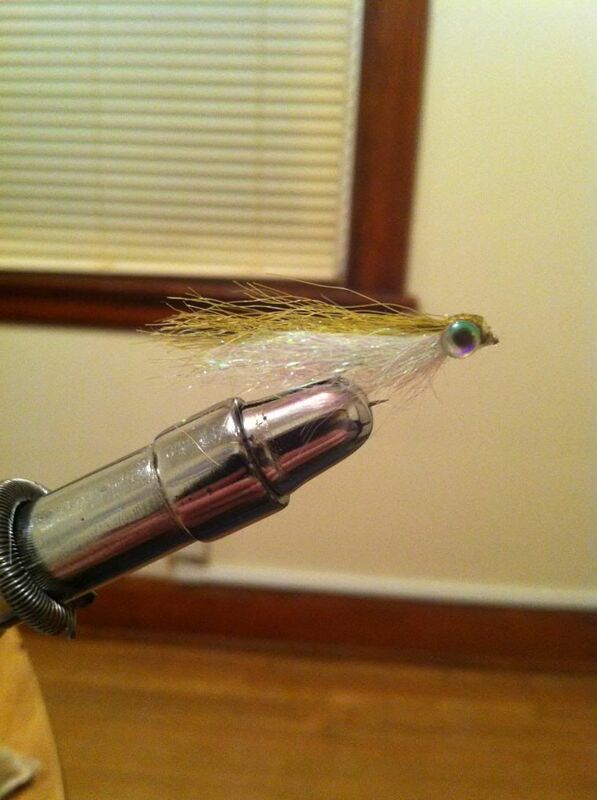 I really wanna tie poppers and other large topwaters, and really wanna make my own Emerald Shiner pattern since they are so abundant as food forage in the Niagara River. 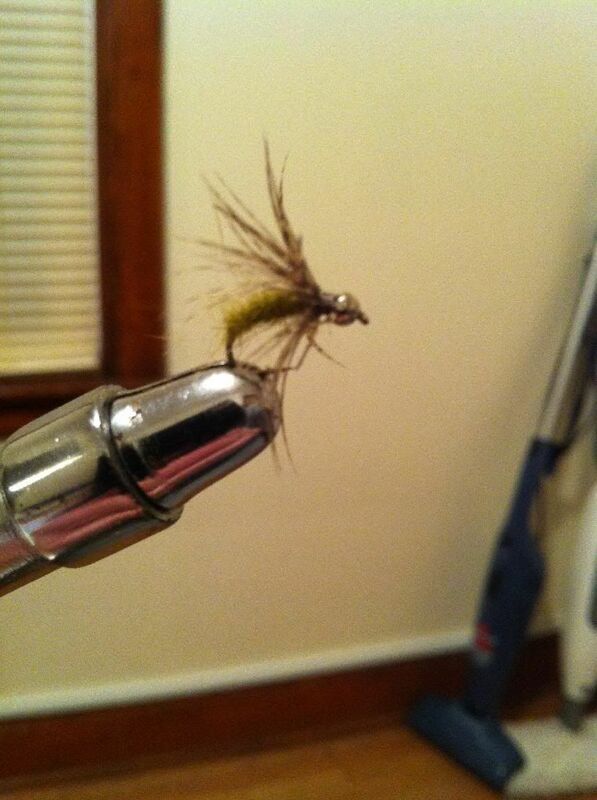 I'll tell you though, cannot wait to be able to fish with some of my flies here, and catch fish on them! 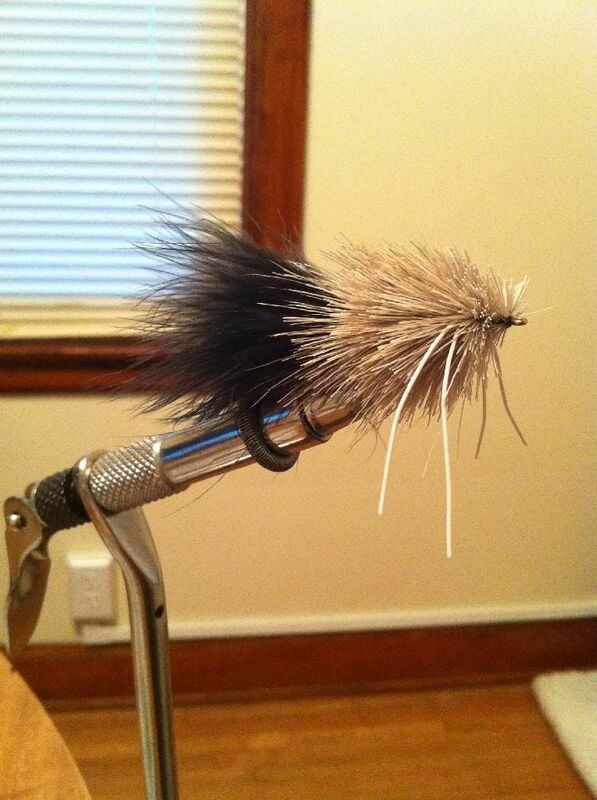 An amazing job you did with your first fly creations. I am impressed and my hearty congratulations to you for your achievement. 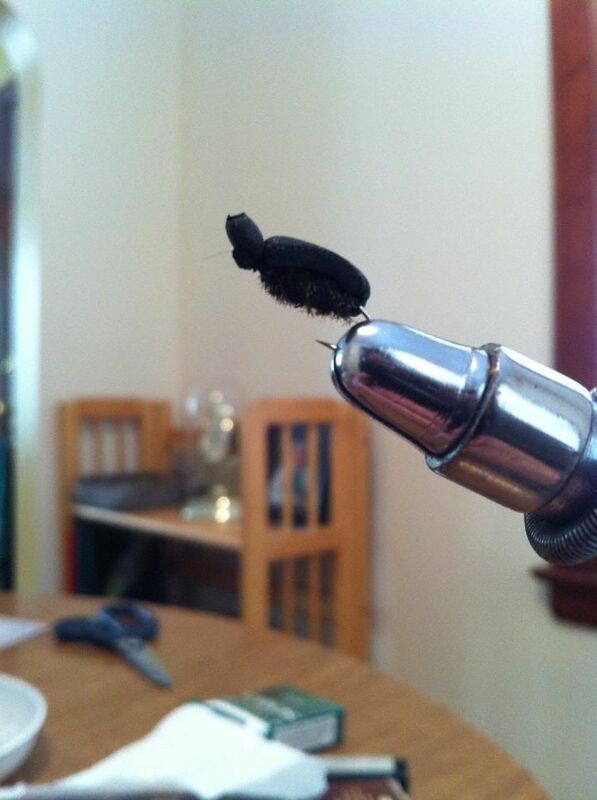 It won't be long before you can go out and try your flies on the fish around your area. I think they'd like them too! 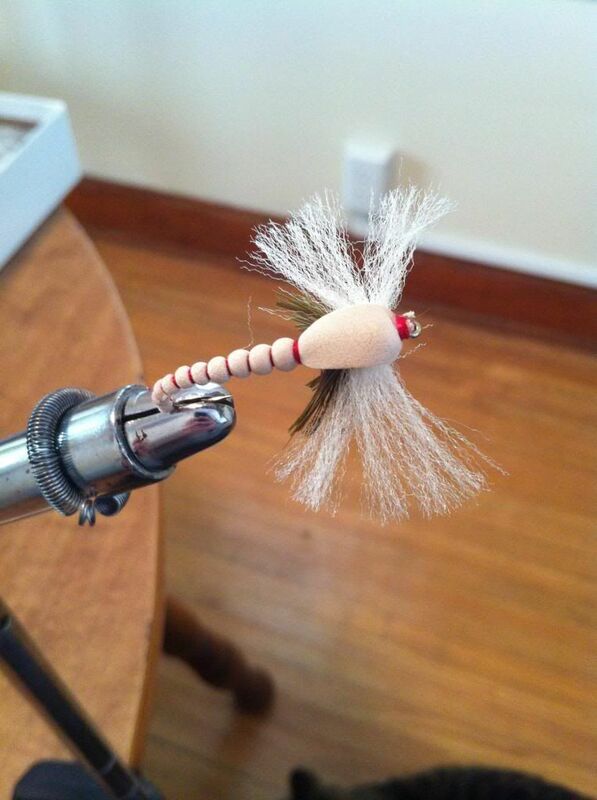 Just one word of advise, for the flies to last and not come unraveled it is imperative that you master the whip finish knot and apply a good coat of head cement on the knot. You have come a long ways in a very short time and this is great! 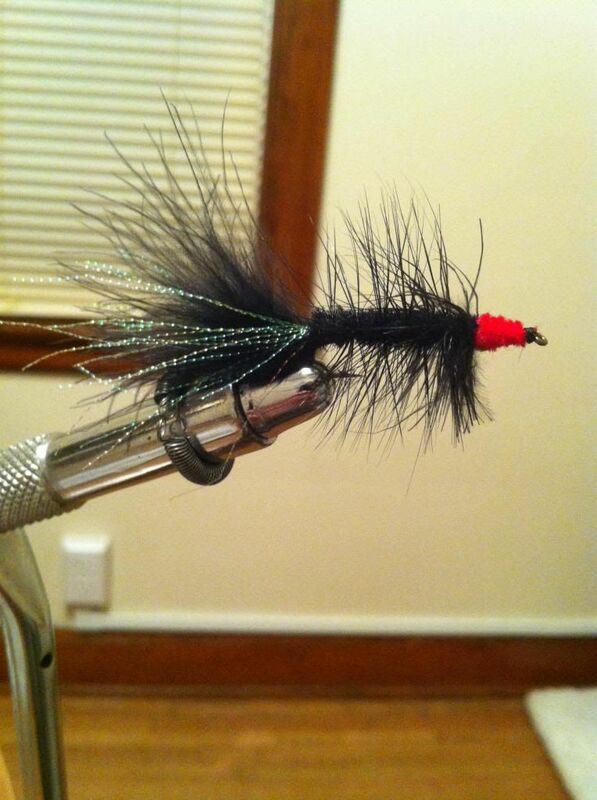 Winter is a great time to tie your year's supply of flies. I am sure you will put them to good use later this year. Keep up the great work and let us see what you are doing. 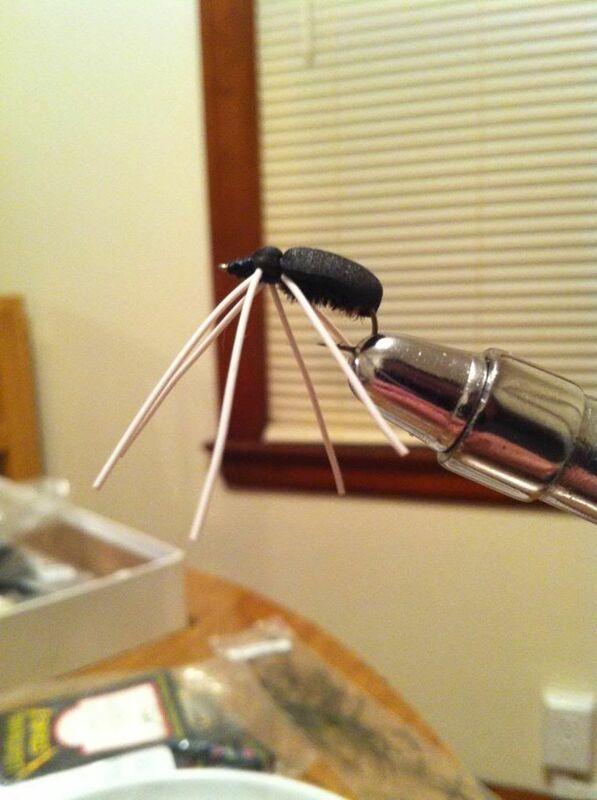 Yes, I'm getting better day by day, and since I started tying after having to hang up the rods for the season, I think I've tied at least one or two almost every night! I have tied quite a few more patterns as well, just haven't uploaded pictured hahaha. But I LOVE the creativity of it, and am actually at the point where I am gonna need more materials soon LOL. 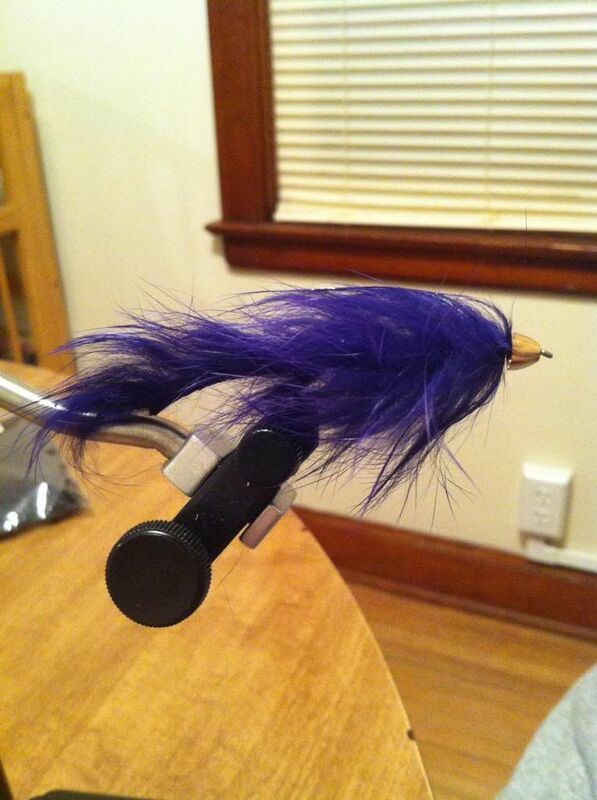 Cannot wait to catch fish (or TRY to) on them! And Stanley, you will be very happy to know that I am one step ahead of you and have pretty much mastered the Whip Finish! I had bought a whip finisher tool because I was having difficulty doing a whip finish by hand, but with the tool it is SOOO much easier. I do also know the Half Hitch Knot, which works really well in case you cannot whip finish. 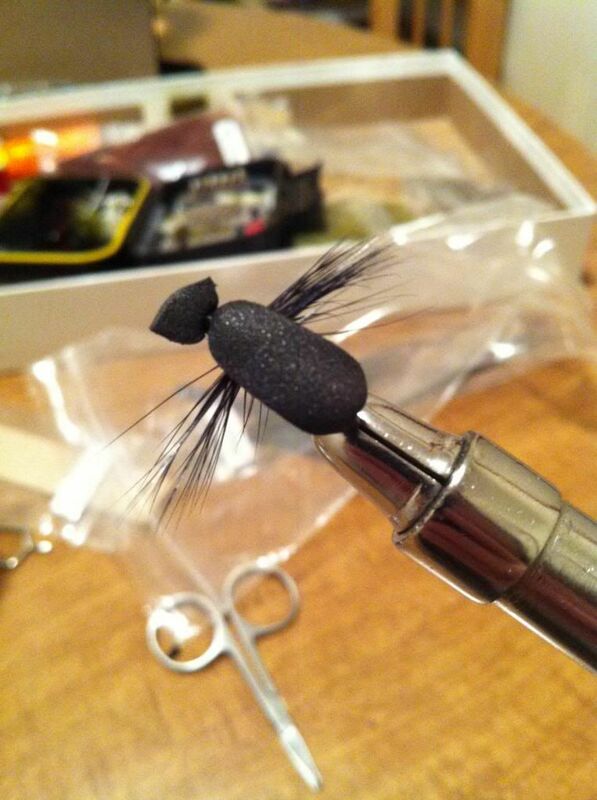 And yes, I do put a tiny amount of head cement on each fly when done. Don't want them unraveling! Thanks guys. I appreciate the encouragement x100. 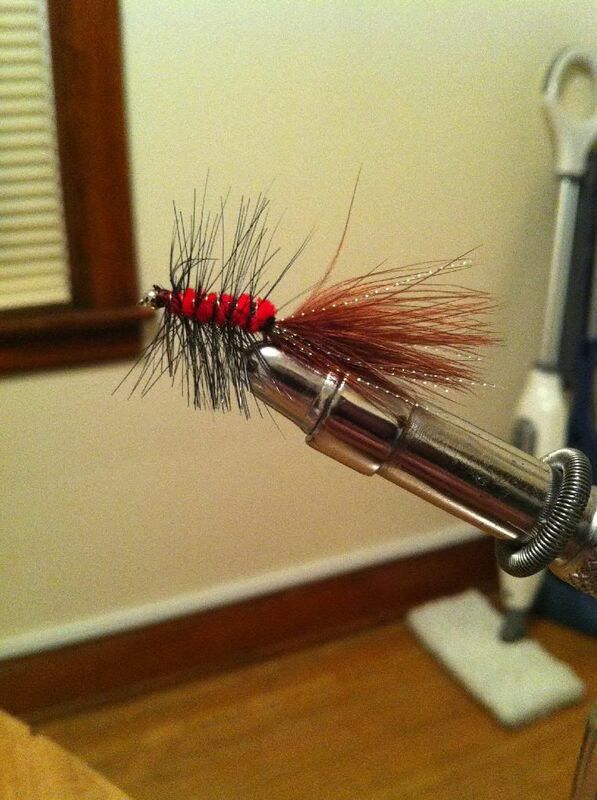 I will be more than happy to post more pics of various flies if you guys would like to see more progress. Just say the words! I know, its been a while since I've posted. The winter has been long, hard, and cold, I have other hardships in my life that I'm dealing with, life in itself has been a pretty bitter pill to swallow lately. 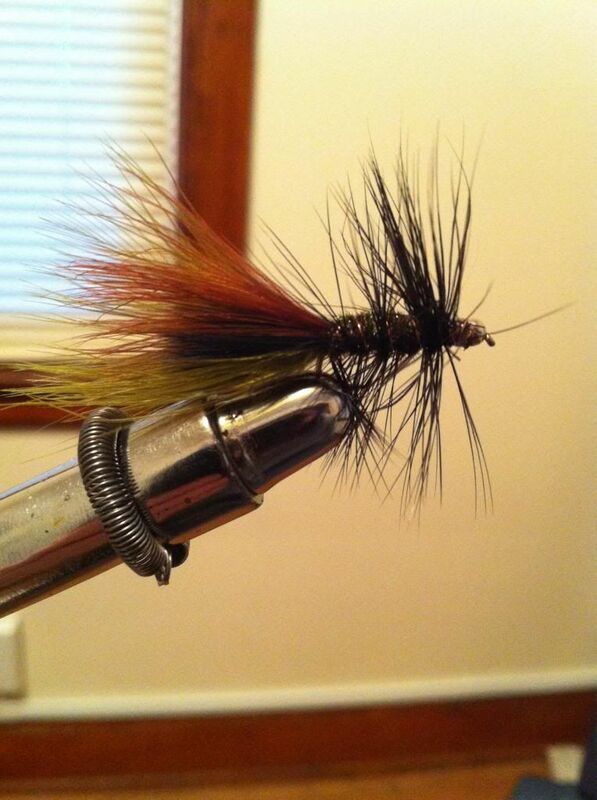 Spring is just about here, the water will be warming up and melting the thick ice soon, and the Steelhead will be making their runs very soon. Luckily this winter, I had lots of time to prepare for them. 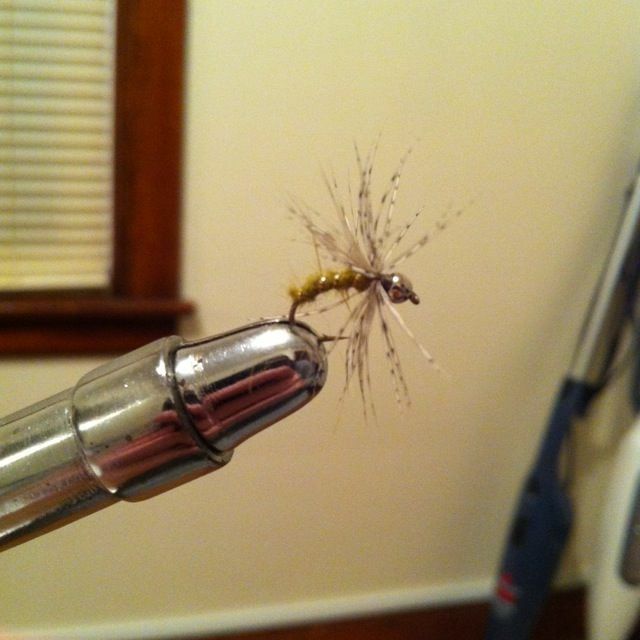 You might say I took Stanley's reply to this thread in stride and did exactly what he said: spent the whole winter tying flies, even a few that were my own ideas. Some came out great, some I still have to practice, others were a complete bust but thats how we learn. I wanted to share this batch with you guys because this is where it all started for me and I value you guys' opinions tremendously. Hey, gotta make sure I do ya'll proud! I apologize ahead of time if this post is super-pic-intensive. I was trying to resize these pics but for some odd reason the changes didn't save . So without further adieu, here is what I have been up to in my absence! 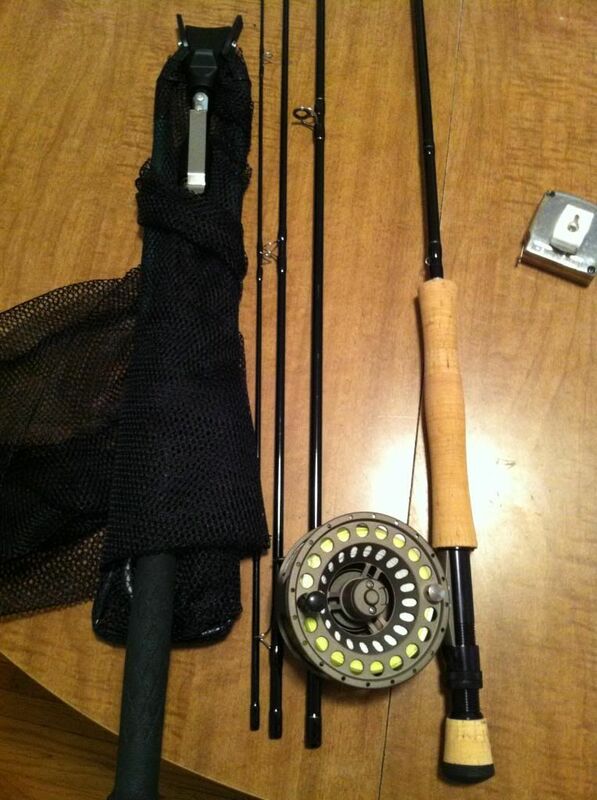 First up, I bought a new fly rod and reel! Its a 9', 8wt rod that I got from Cabela's on sale for $69, original price $130! Couldn't pass up that deal! 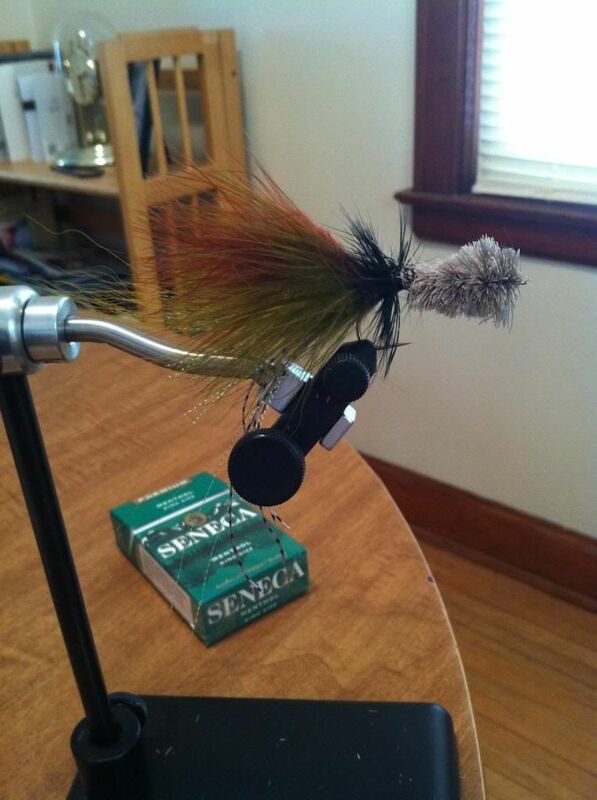 I also find from my 5/6 wt Wild Water combo that I prefer metal, large arbor reels, and this one works very, very well. Super easy to change the retrieve direction, which I always have to change them because I cast left handed and retrieve with my right. They are alway set up for left retrieve! 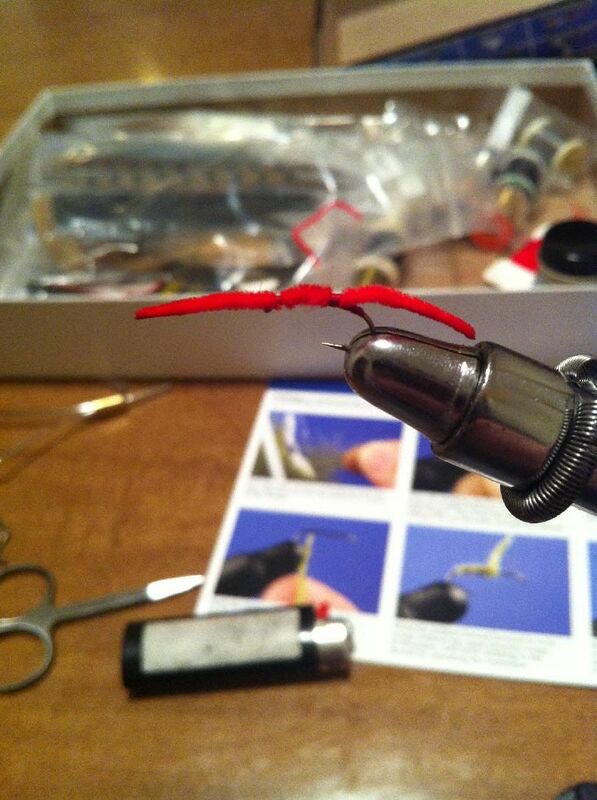 The rod has a nice action to it, and it casts very nicely. Double hauls made this thing soar! Now for the flies. I will try to explain any as best I can. 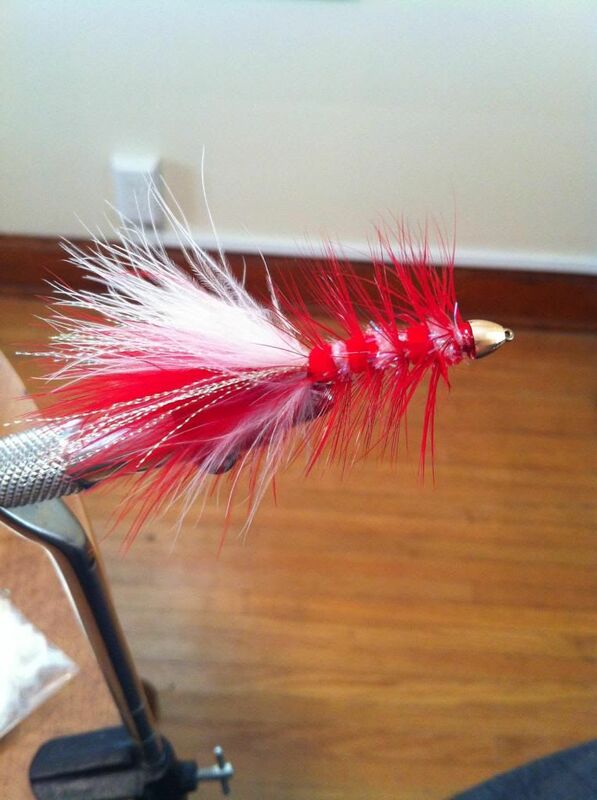 After tons of research and asking questions to local guides and others, besides the obvious ones, I found patterns that were the most commonly used by fly fishermen in these parts. 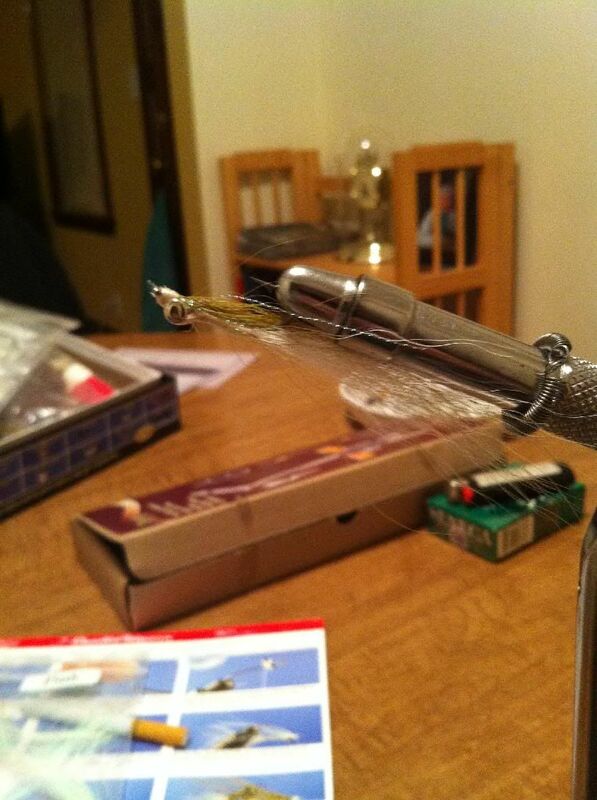 So that is what I have concentrated most of my tying on. 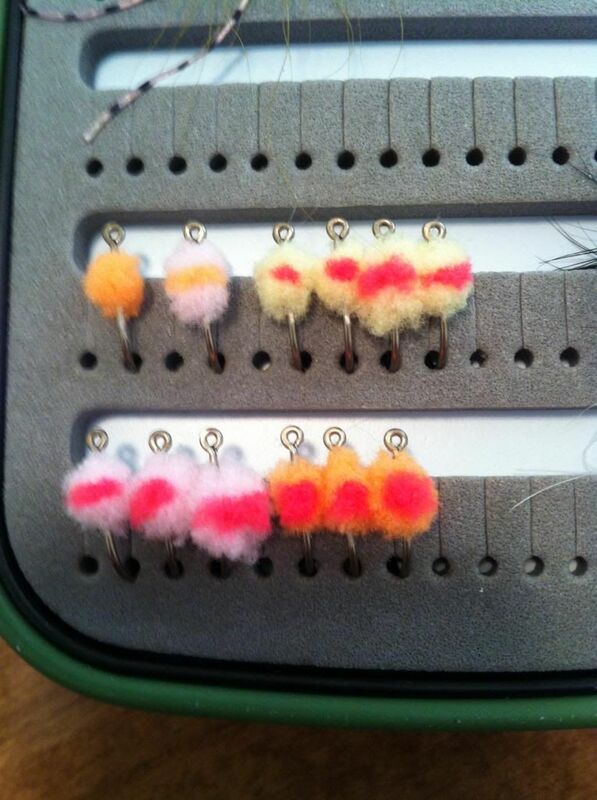 I also now see the great importance of Woolly Buggers and their many variations. Seems lots of fish in this area are quite partial to Buggers. 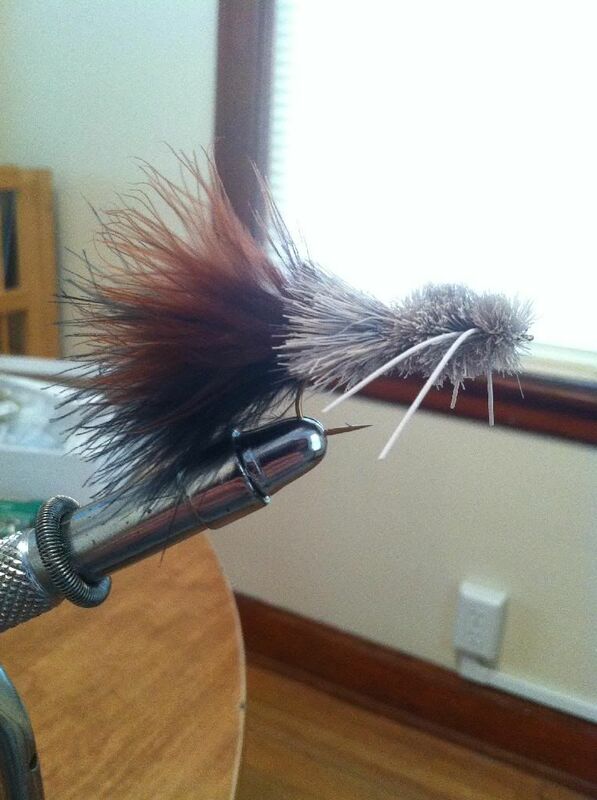 This one here is the first Deer Hair Popper I attempted. Everything was going perfectly fine until the very end, when I accidentally cut the thread holding the tail. 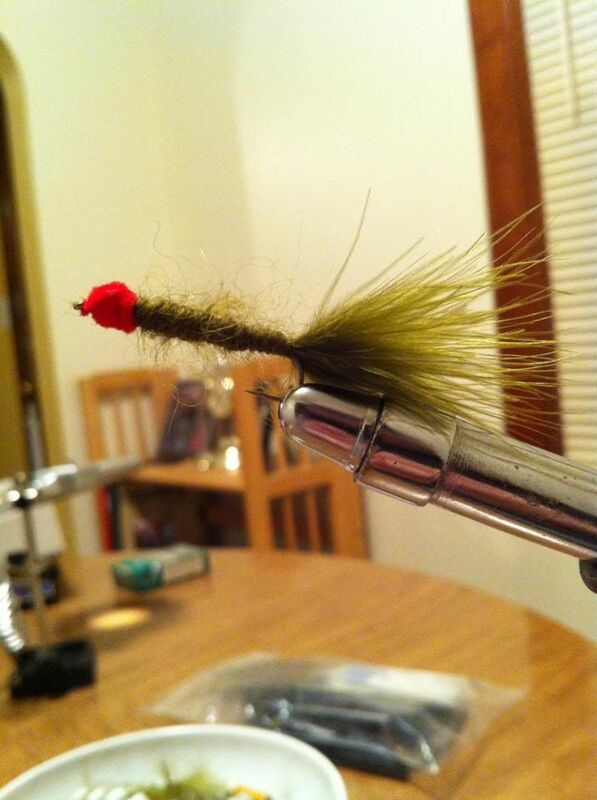 I did everything I was able to think of to fix it such as getting a Jam Knot and a couple of Hitch knots over it, even tied in some saddle hackle to try and hide it better, but I don't think it will hold up to the jaws of a Largemouth or Smallmouth Bass too well. 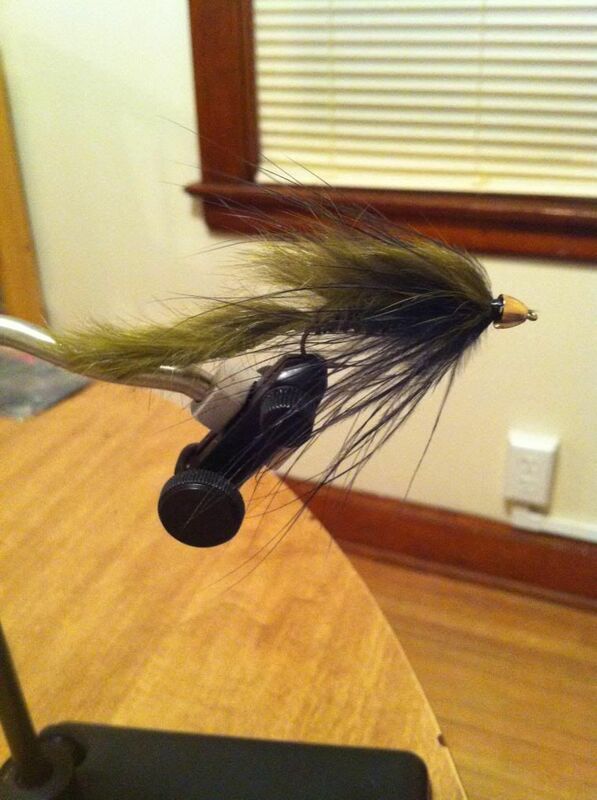 Also, gotta get better at tightening up the deer hair. Oh well, would of been nice. Practice makes perfect and learn from mistakes, right? 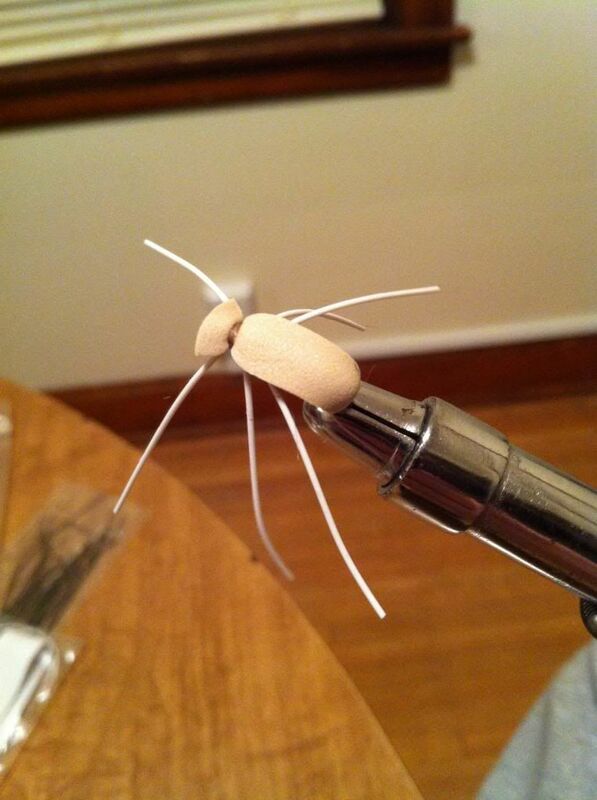 And this is the first Foam Body Popper I've tied. This one came out really nice IMO, especially for a first effort. I wanted to add in some legs to the body, but found out the hard way that getting a bodkin through the body is quite tough. I guess its hard foam. Still, I think with its size and color, the soon-to-be-spawning Northern Pike won't object too much, and I'm almost certain it will be a Bass killer! 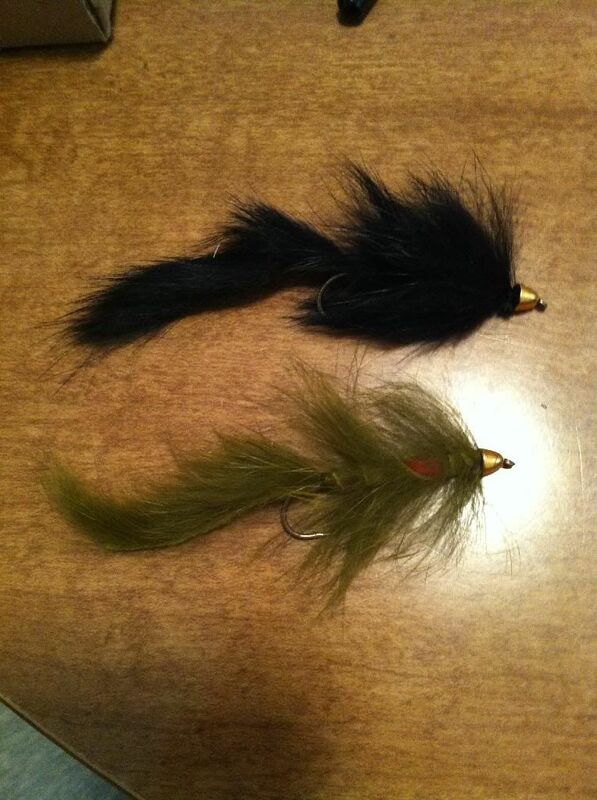 More Steelhead prep, a couple of San Juan Worms, tied using pearl core braid instead of chenille. LOVE the way these guys look! 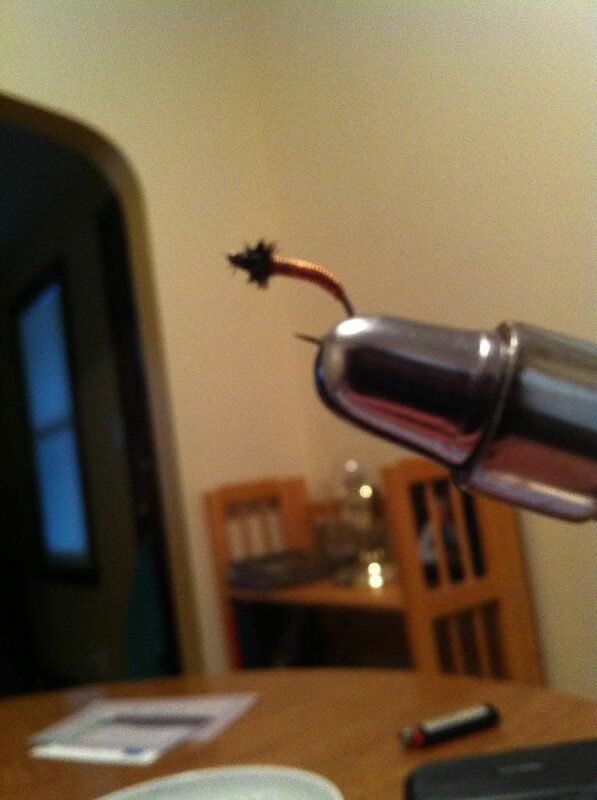 The little flash given by the pearl core is wicked in water! OK, will leave at that for now. I still have to get used to palmering overall, I actually did get much better at it since these pics were taken. 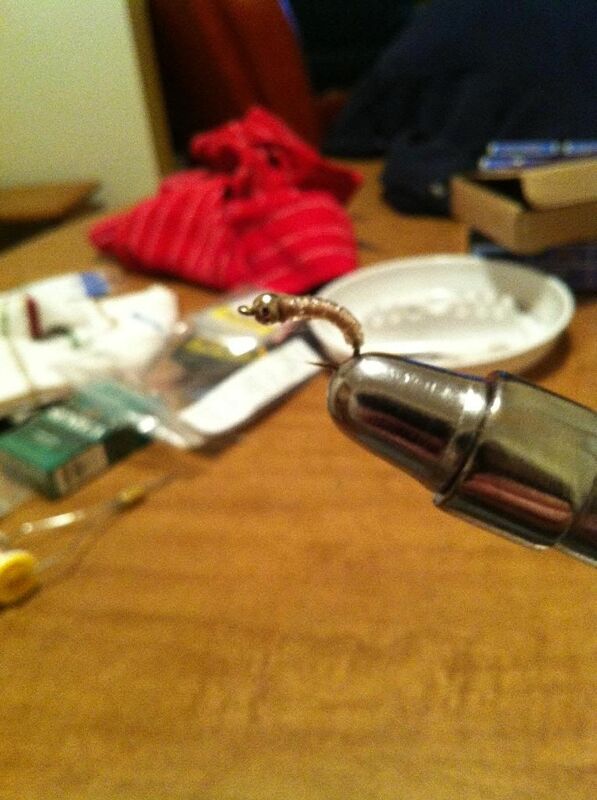 Overall, as you can tell I am enjoying fly tying immensely and feel I am doing pretty good, though far from a pro LOL. I still have lots to learn and am definitely putting my time in the workshed. 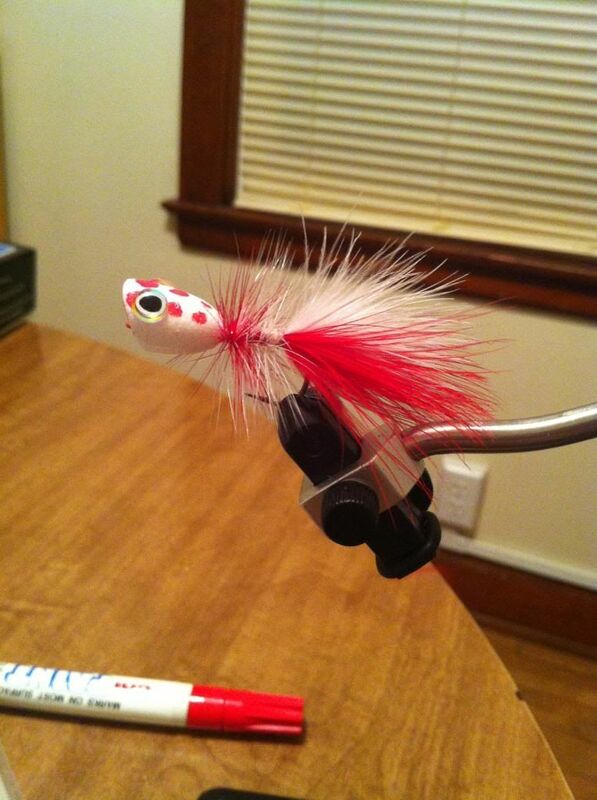 I am really hoping and looking forward to catching fish on these. As alway, all of your thoughts and suggestions are welcome. And of course, I am glad you are all doing well! 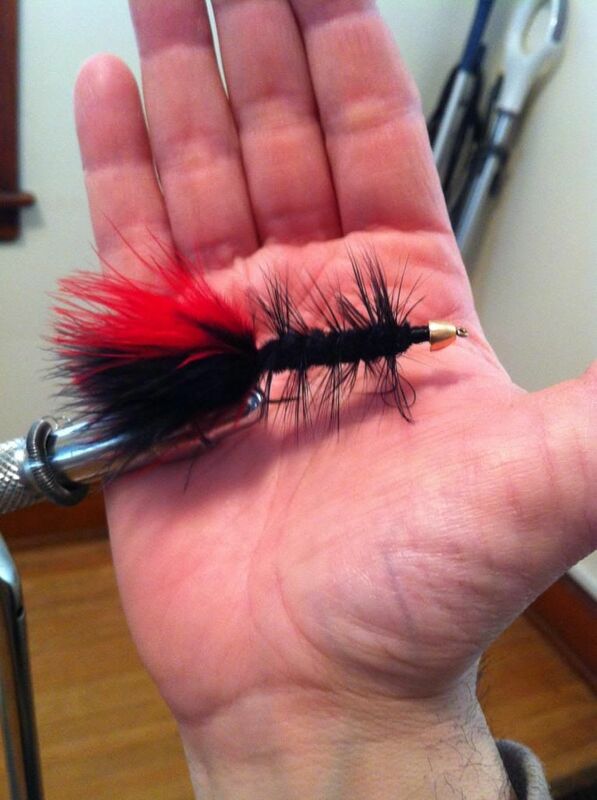 Those are great looking flies and you will be able to use them in just a couple of months. 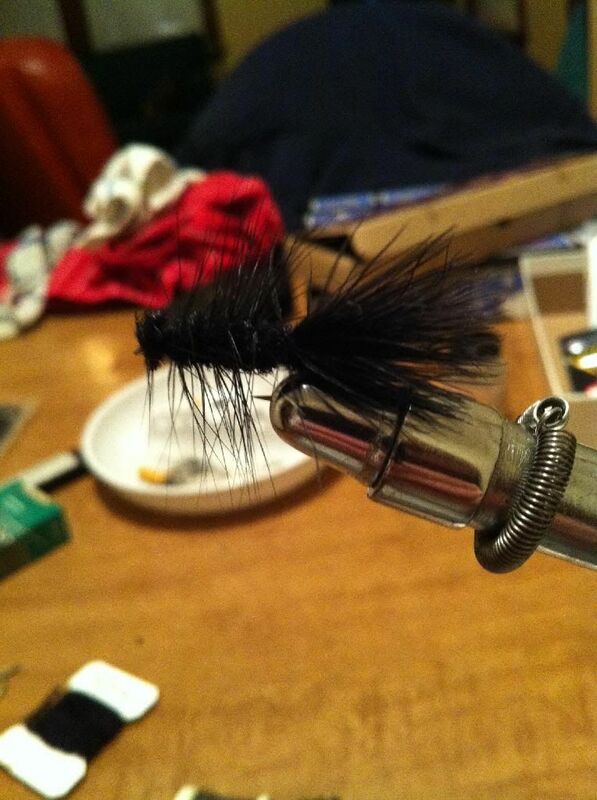 There is nothing more satisfying that figuring out what flies will work and to catch the fish with your own creations. 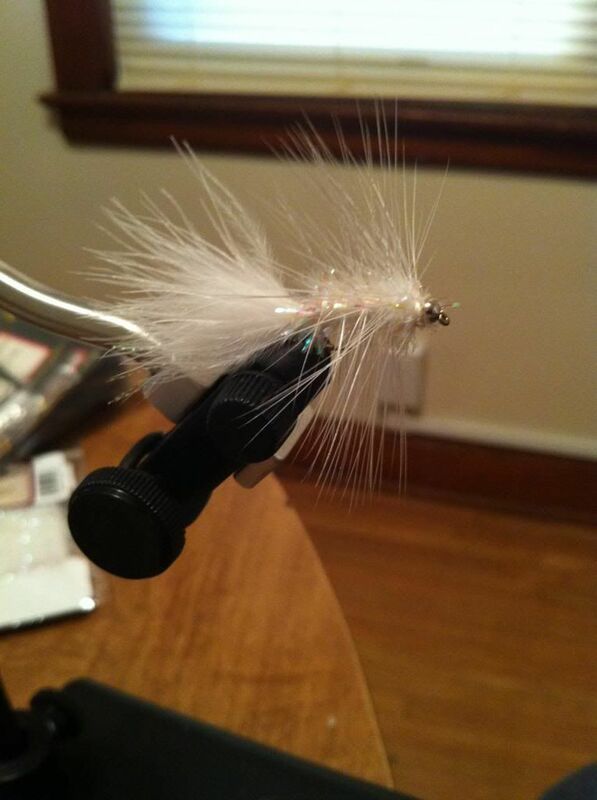 Glad you got involved with flyfishing last year. Better get that laptop and rejoin RWFF as there has not been too much activities except for some great new outings by Martin and excellent fishing posts by Roger and Badger. We will be entering our quiet season (Summer) and we need all the help we can get on RWFF.